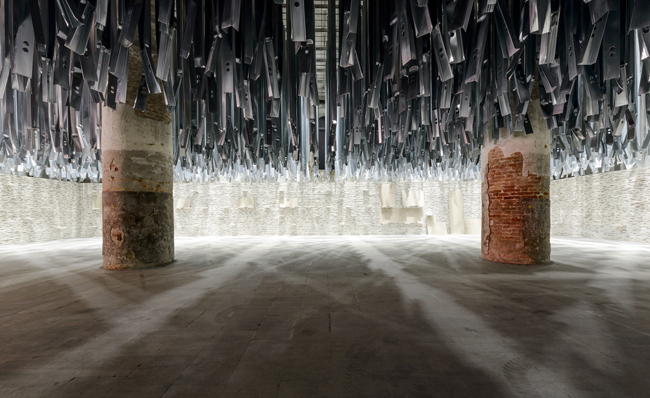 Just like one can make new sneakers from old fishing nets scavenged from the ocean, it’s also possible to make a new installation from old drywall and aluminum partitions left over from previous Biennales. Which is exactly what Alejandro Aravena – the highly-esteemed, socially conscious Chilean curator of the 2016 International Architecture Exhibition at the Venice Biennale – has done. Two of Aravena’s favorite themes are “the world’s garbage can” (including construction waste), and the sustainable use of all resources. Other subjects which he is fond of are: an unqualified workforce, simple (even primitive) construction materials, mass gatherings, migrations, and other unfortunate human conditions – all of which should be widely resounding in the minds of today’s architects. By covering both the earthly and intellectual resources that can be found in Estonia, Latvia and Lithuania, the first-ever unified pavilion from the Baltic States agreeably conforms to Aravena’s thematic terms. The Baltic pavilion illustrates both the similar and the dissimilar among the three countries: in the air (on display are many views “from above”, which can also be paraphrased as “from the sidelines”), on the ground (e.g., the forthcoming Rail Baltica railway line), and underground (e.g., mineral resources that the pavilion’s creators advocate for use as construction materials). Perhaps the greatest, and maybe even only, fault with the Baltic exhibition is its intensity, defragmentation, and the authors’ (who have all just recently left the heavily theory-laden halls of their respective architecture schools) frequent inability to communicate in a literally appealing way – the subjects that they cover are engaging and potentially more interesting to the people of the Baltics than to just an audience of architects. It’s easy to imagine the success of this exhibition on a rainy day in Riga, Tallinn or Vilnius, when one doesn’t want to sit at home, but going out in the streets is even more unappealing: two or three hours spent walking through an exhibition that focuses on this whole region would be immensely satisfying to most people – be they a disheartened politician, a school-boy, or a housewife – not even mentioning its potential attraction to an educated, modern citizen with an interest in architecture and infrastructure issues. The exhibition is appealing on an artistic level as well. Housed in a gem of Brutalist architecture – the concrete Palasport sports arena – the exhibits have been set up in a variety of heights and levels, all under a white canopy-like ceiling, thereby making complete use of both the playing field and the bleachers. I assume that, like the critics, most visitors will be able to appreciate the poetic lightness of the exhibition’s composition, and that they will inspect a bit closer at least some of the exhibits – there’s no time to look at them all. 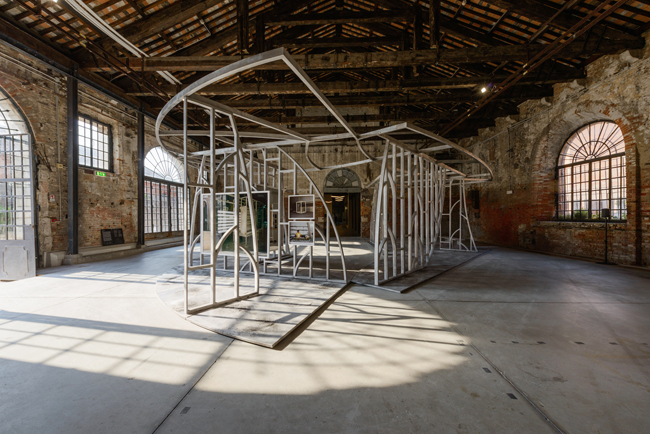 And that’s the classic problem that most of these large Biennales have – the creators of the exhibitions fail to see their displays through the eyes and minds of the visitors. Placing just one powerful object on show, and accompanying it with one paragraph of text, Australia debuted their new pavilion (it officially opened during the 2015 Art Biennale). Like faraway Australia itself, “The Pool” illustrates a simple subject that neatly fits into the framework of architecture. 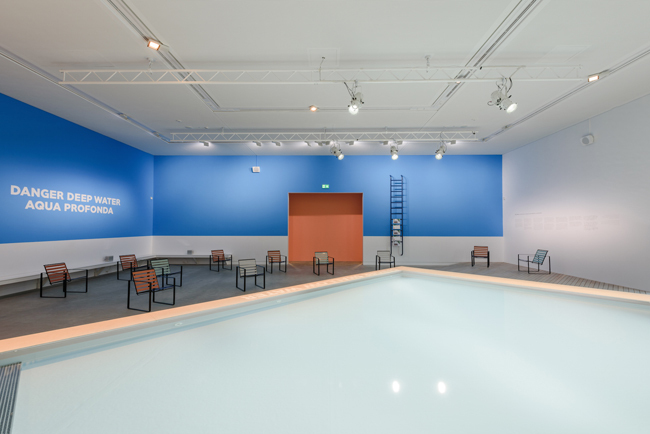 Public bodies of water, the pools of schools and villas, an immense pride in their Olympic swimmers – compared to the Biennale as a whole, the theme of “a pool” could be suggestive of decadence if it wasn’t one of the most accessible forms of government-sponsored public architecture. Aileen Sage Architects and Michelle Tabet, the curators of Australia’s pavilion, were able to fit their country’s sizable theme into one object, putting everything else – from historical facts and societal memories, to architectural typology and wonderful photographs – into an engaging accompanying book. Since every year is someone’s first time visiting Venice, it’s worth mentioning that the Biennale has not only two addresses (The Gardens and the Arsenale), but also two exhibition types. 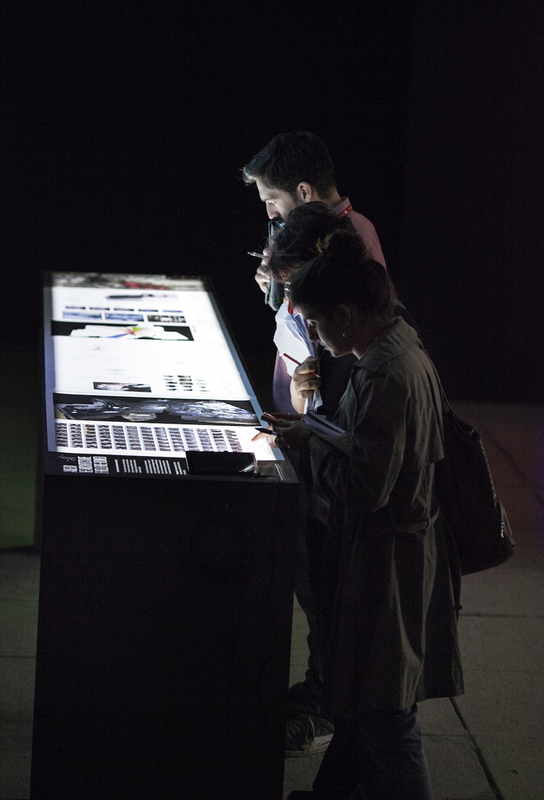 The most important one is the main exhibition, which always has a firmly defined theme and a specially-selected curator; in creating his or her subjective and visual concept for the main exhibition, the head curator works with a select team of architects. The other exhibition type is the national exhibition, which is held in each country’s national pavilion (if they have one) or elsewhere (e.g., the Arsenale); although the national exhibitions are encouraged to adhere to that year’s theme, they are not obliged to do so. As one could expect, many national pavilions kept to the themes of refugees, human migration, and temporary housing/shelters – and engagingly, at that. 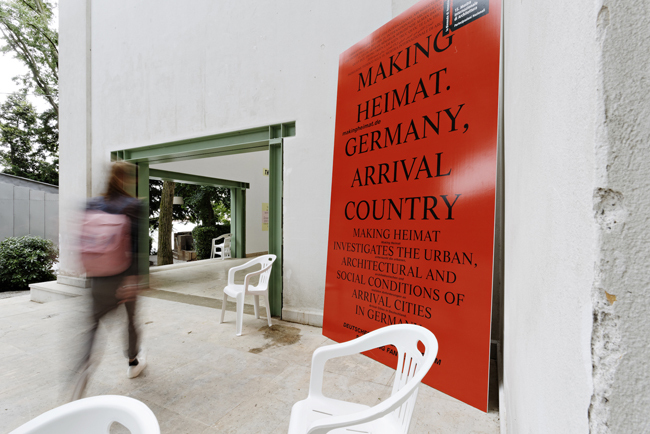 Germany’s pavilion chose a powerful and architectonically radical method with their exhibition entitled “Making Heimat. 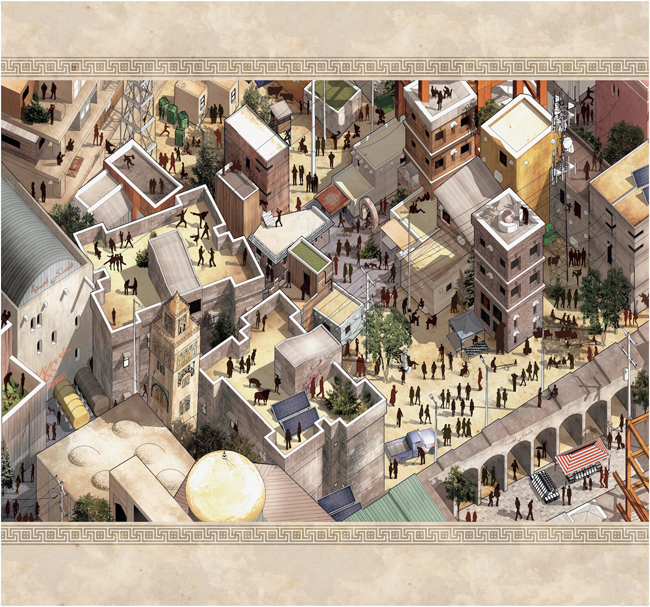 Germany, Arrival Country”, by the German Architecture Museum DAM, and curated by Oliver Elser. 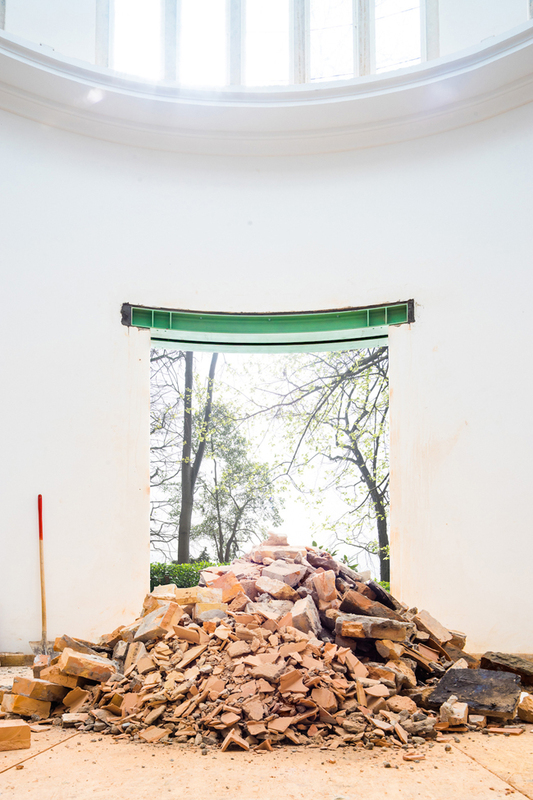 Working together with the Berlin architectural offices of Something Fantastic, four new entrances were knocked out of the outer walls of the historic German pavilion, making the once-enclosed building into an almost tent-like structure. Through this action, Germany declared that it has no borders – it is open. What else was there in Germany’s pavilion besides low-cost shelters and other architectural projects linked to the taking on of refugees? The most important things, of course: ayran (a salted yogurt-like drink popular in the East), and free wireless internet and electrical outlet access. Displaying the winners of the From Border to Home low-cost refugee housing contest, Finland’s pavilion had a leitmotif very similar to that of Germany. 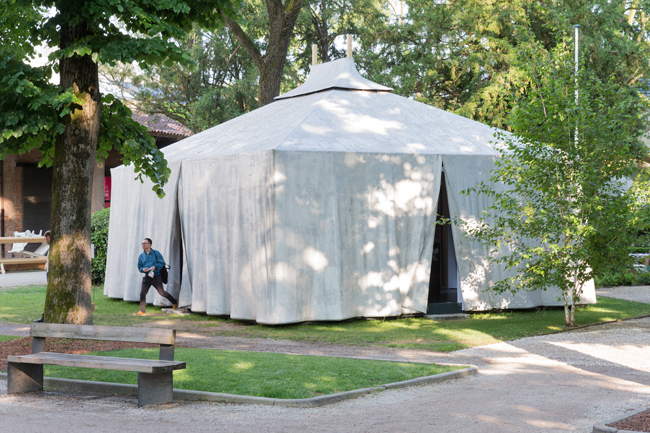 Right next to the Finnish pavilion was a burlap refugee-camp tent, spray-painted silver. Upon entering the tent, one is transported to the Western Sahara, a former Spanish colony that was occupied by Morocco in 1976, forcing its inhabitants to flee and cross over the border into Algiers. Although the former inhabitants of Western Sahara declared independence in 1976, the territory is still occupied by Morocco. And, as a result of having been a refugee camp for 40 years, there is now enough context for speaking in terms of architecture. 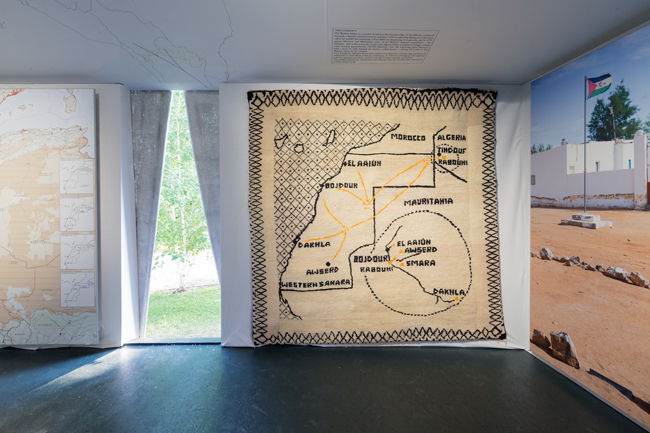 The Western Sahara exhibition – which featured carpets woven in the camp, alongside works by renown architectural photographer Iwan Bann – was not the only show in which one could notice feminine themes that are especially prominent in times of crisis: the hearth, soup, and handcrafts. 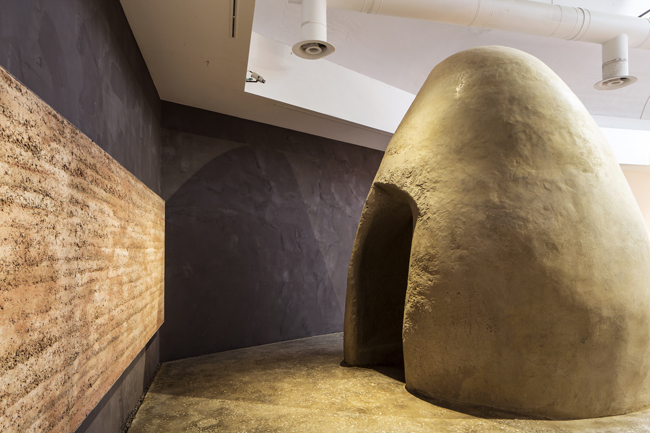 Even China, which has more recently been known as being quite ambitious in the fields of architecture and art, went down a more esoteric path in this Biennale by showing poetic fashion- and homeware-themed installations, as well as architectural projects that adhere to a decidedly Taoist belief system. “Daily Design, Daily Tao. Back to the Ignored Front” (curated by Jingyu Liang, Approach Architecture Studio) is a group exhibition whose architectural narrative is bolstered by fascinating costumes created by the well-known Chinese designer Ma Ke, as well as a children’s playhouse erected on the pavilion’s lawn. Among the national exhibitions, I’d like to underscore the countries that are promoting locally-sourced construction materials and how these materials influence architectural form, as well as how these same materials can be used to solve both social and aesthetic problems (in his part of the exhibition, Aravena has also not shied away from speaking about beauty; the installations there are visually attractive and they smell good – reminding us of the age-old adage that natural and simple can also be beautiful). Bahrain’s exhibition (and the obligatory aluminum smelter advertisement) was compelling in that aluminum was one of the most popular materials used at the Biennale, most often in the partitions and dividing walls. 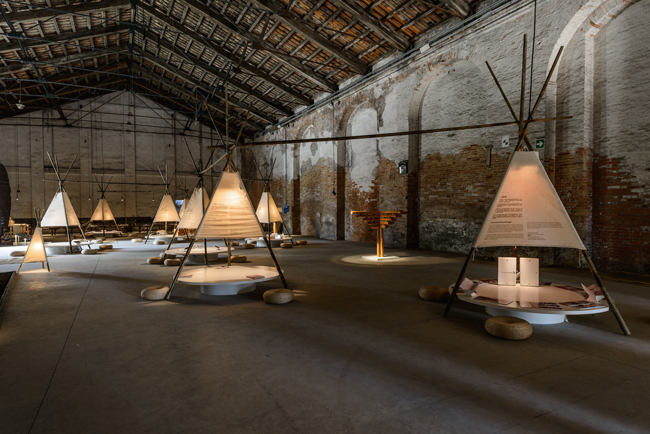 Sweden, for its part, illustrated the potential of cross-laminated timber in its exhibition titled “The Forests of Venice”; although Sweden was also represented in the unified Nordic pavilion, it had a separate exhibition in the more peripheral Orangerie of the Gardens. The fact that every year each of the Nordic countries presents something individually, in addition to the unified Nordic pavilion, is something that supporters of the unified Baltic pavilion would do well to remember – as other local critics have already noted, cooperation does not always turn out as successfully as one would like, and perhaps may even lead to mediocrity and too much political correctness. The seriousness of its theme notwithstanding, the Biennale’s central exhibition had an aura of brightness and motherly caring. Just like a house that in order to be clean, must simply be cleaned, Aravena believes that every societal problem has a solution. For instance, any architectural structure can be built by using locally available materials and the potential workforce that is there on site, however unqualified they may be. Indian architect Anupama Kundoo demonstrates the next level of this theory right there – with a house that can be built from reinforced concrete blocks in six days. A design for schools made from bamboo and adobe in Bangladesh (architect – Anna Heringer) is just one example of how education can be implemented in overcrowded or temporary living areas. A complete polar opposite of the handcrafted, on the other hand, is the brain potential that is best defined by the work produced by the team at Forensic Architecture. 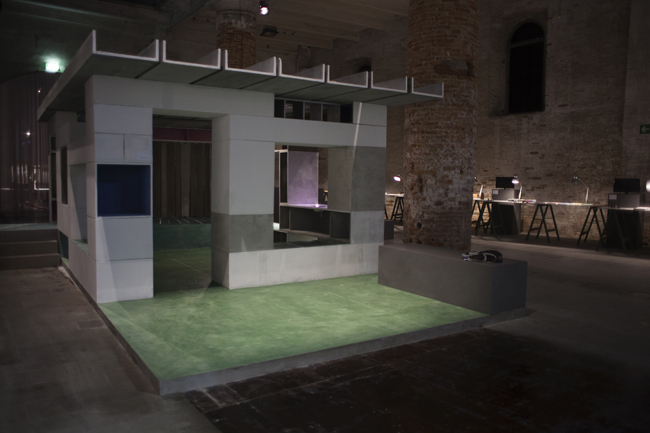 Clearly, it is impossible for one to experience all of the levels of the Architecture Biennale. They are just fragments that one critic or another, or a visitor, simply happens upon. Most electronic media just republish press releases and quickly think up top-ten lists. One should take note that these days, equally good critique can be found in the photographs, videos and write-ups that are posted on social networks, and that the winner of this year’s top prize for a national exhibition – the Golden Lion (which went to Spain’s pavilion, which featured building projects that were either frozen or abandoned during the economic crisis, as well as the understated architecture that followed) – is just the opinion of one group of people. Similarly, the assessment of this very review could also change over time, for impressions only gradually gain worth; and especially in the context of Latvia’s active architectural scene, where the Latvian National Museum of Art has just reopened after considerable reconstruction, and submissions to the international competition for the architectural design of the Latvian Contemporary Art Museum are finally available for viewing.